Nothing says "welcome" or "thank you" like a home-made gift or meal. Make something with love, wrap it up nicely, and you've got a great personal gift to give. These read-to-fix mixes are a great idea and are not just for soups. 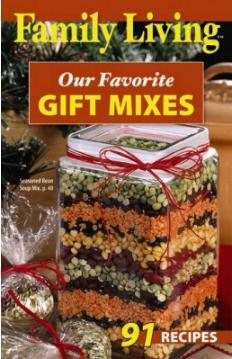 They also offer "recipes" for cookies, beverages, cake mixes, fudge, and more. And don't forget to include the baking/making instructions! Gifts I'd consider giving (and certainly making to eat myself) include: Oatmeal Raisin Cookie Mix; Mint Tea Mix; Whole Grain Bread Mix (hearty); Cinnamon Oat Pancake Mix; Cheddar-Garlic Biscuit Mix (sounds yummy), and Stir-fry Sauce. There are 91 recipes to choose from. These mixes are ideal for last-minute gifts as many of the ingredients will be readily available on your shelf or in your cupboard at home. Start collecting pretty containers. I'm a convert to these great little Family Living books. Such superb value for money in this failing economy. Conclusion - Great value booklets packed with wonderful gift ideas.